Merger with new leftist movement fails miserably: Meretz Chairman Chaim Oron said Tuesday night following the publication of TV exit polls that "the Left suffered a harsh blow". According to the polls, the left-wing party will only have four representatives in the next Knesset. Oron promised that his party would continue to be a key element in the political arena in a bid to hold a dialogue with different sectors of Israeli society. 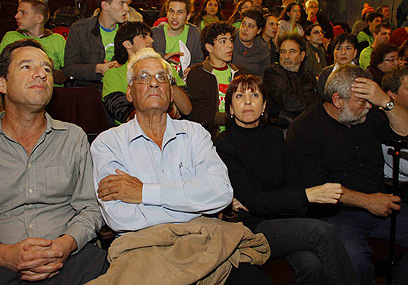 Meretz had hoped that its merger with the new left-wing movement would help the party gain at least six Knesset seats. According to Channel 1 exit poll the party got five seats, while all other polls predicted it would settle for only four. "Based on the energies which I saw today as well, and the forces existing within us, we must overcome the difficult feeling we are experiencing this evening. We won't be annihilated," Oron stated, promising that Meretz will continue to be "a key element in the establishment of a Zionist dovish and humanistic Social-Democratic Left in the State of Israel. This vacuum has not been filled in these elections." Oron added, "The fact that what is perceived as the leftist camp – Labor and Meretz – and those groups which did not cross the threshold, reached less than 20 Knesset seats, must switch on a red light for all of us. "First of all, however, this fact must create a commitment of each and every one of us to do what the Israeli Left needs so much… Out of a desire to hold dialogue with different sectors of Israeli society; out of a desire to say clearly that the State of Israel is not divided between Kadima and the Likud, between Lieberman and the National Union." The other side of the leftist camp which Oron referred to was also disappointed by the election results. Senior Labor Party members responded to the exit polls, which gave the party between 13 to 14 seats, by stating that "the public has spoken." Education Minister Yuli Tamir and MKs Ophir Pines-Paz and Shelly Yacimovich all agreed that the voters sent them a message that the party must sit in the opposition. Yacimovich said, "This is a democratic decision which is very difficult for us. The people have spoken. We will sit in the opposition courageously and reestablish ourselves as a peace-seeking social-Democratic party." Pines-Paz added that "something very serious happened to us – we paid a heavy price. Labor lost these elections, and it must self-examine itself." See all talkbacks "Meretz chairman: Left suffered harsh blow "